Pass & Seymour 2-Pole Straight blade receptacle and USB charger in white color, has current rating of 15-Amps and voltage rating of 125-Volt AC. It features sturdy thermoplastic construction for long lasting service. 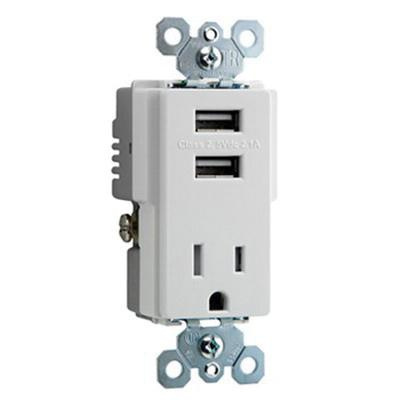 Receptacle and USB charger measures 1.7-Inch x 1.6-Inch x 2.7-Inch. Receptacle accommodates stranded/solid copper wire of size 14 - 10-AWG and supports both back as well as side-wired connections. It supports various USB 2.0/3-port compatible devices. Patented shutter system restricts improper insertion of foreign objects. Receptacle and USB charger allows you to simultaneously charge two devices. It has total charging capacity of 2.1-Amps. This receptacle and USB charger is the perfect solution to power up mobile devices quickly and reliably without the need for bulky AC adapters. It accepts standard Pass & Seymour wallplates. It is compatible with iPod, phone, tablets, Smartphones, mobile phone, GPS, Bluetooth headsets and Sony PlayStation Vita. Receptacle and USB charger is ETL listed.